Preheat grill to medium-high heat. Slice each block of tofu lengthwise into 6 pieces for 12 pieces total. In a shallow dish, whisk oil and 1 Tbsp. soy sauce together. In a separate bowl, combine dried cherries, Crunchmaster® Original Multi-Seed Crackers, rosemary, chili powder, sea salt, pepper and brown sugar; mix well to combine. 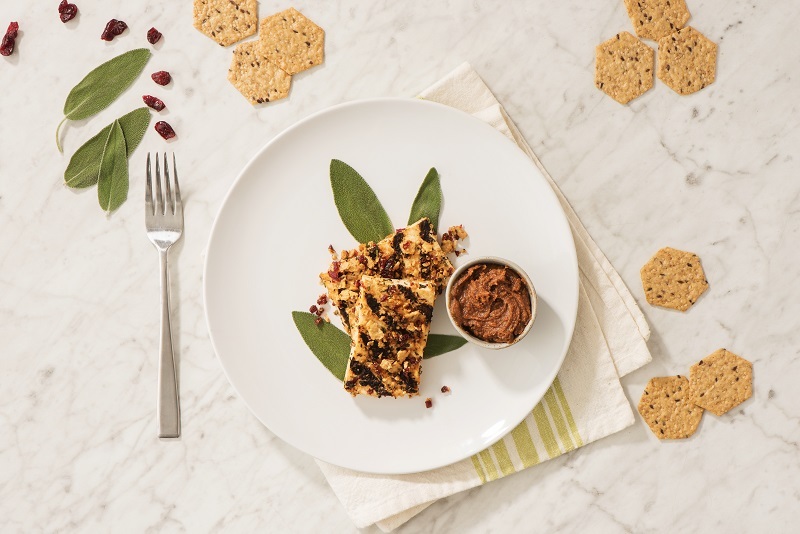 Dip tofu pieces into oil mixture then coat with crushed Crunchmaster® Original Multi-Seed Crackers. Brush grill racks with oil. Grill tofu for 6 minutes; turn tofu and cook for another 7 minutes. In a small saucepan over low heat, whisk together almond butter, lime juice and soy sauce until it forms a liquid consistency, approximately 3 minutes. Remove tofu from the grill; transfer to a serving platter with fresh sage and almond butter dipping sauce on the side.